NOAA Fisheries researchers are having a hard time believing their preliminary findings indicating that sea lions in the Columbia River estuary may be eating nearly half of the spring Chinook run before it reaches Bonneville Dam. Michelle Wargo Rub, a NOAA scientist, said the latest results from her group's 2014 adult fish-tagging efforts estimated that overall spring Chinook survival from Astoria, Ore., to the dam was about 55 percent, after adjustments for tagging mortality, turnoffs and harvest. Predation on spring Chinook near the dam itself is only about 2 percent. Wargo Rub gave her report at a Nov. 4 presentation before the Northwest Power and Conservation Council's Fish and Wildlife Committee. With the help of commercial fishermen and tangle nets, researchers have been working on the study since 2010, PIT-tagging about 2,200 spring Chinook near Astoria, and watching the growth of sea lion numbers every year since. Wargo Rub said estimates from 2010 pegged about 7,000 pinnipeds in the lower Columbia region, made up of 3,000 sea lions and about 4,000 harbor seals. In the past two years, many more have shown up, drawn by improving smelt runs. They are the most likely culprits in this seagoing whodunit, if indeed, the survival data turn out to be accurate. The West Coast population of California sea lions has grown to over 300,000 from an estimated 10,000 in the 1950s, with help from passage of the Marine Mammal Protection Act in 1972. Last June, Wargo Rub shared her 2013 results with NW Fishletter, which found that about 31 percent of the spring Chinook run exhibited unexplained mortality from the estuary to the dam. Her results attracted some attention and led to her presentation at the Council meeting. She noted that adjustments to the preliminary survival estimate may change by a few percentage points up or down, but she called it "fairly troubling." In 2014, survival was about 40 percent through April 7, then above 60 percent through May 2, and more than 80 percent through June 20, when river temperatures were much higher. Wargo Rub said that she expected the later migrating fish to show lower survival rates because the earlier fish seemed a little more vigorous during tagging operations. If the results are taken at "face value," and applied to the run at large, she said it implies that 35,000 to 99,000 fish annually have returned to the river, but dropped out of the system before they got to Bonneville Dam. Over the past 5 years, some earlier tagged fish have taken up to 45 days to get to the dam, while later on, the trip only takes about 2 weeks, she said. "Even I have a hard time believing these numbers," she said. "They seem very unrealistic to me. However, save for the 2014 estimate, they do fall into this window of theoretical estimates of predation that were based on bioenergetics modeling of 4,000 harbor seals and 1,500 sea lions eating a diet comprised of about 25 percent adult Chinook." Sea lion numbers seem to be increasing in the estuary, based on counts of the pinnipeds at haul out sites near Astoria, according to Oregon Department of Fish and Wildlife surveys, said Wargo Rub. Counts have been variable with 80 individuals in 2010, 109 in 2012, 495 in 2013, and 616 earlier this year. She noted these are very minimum estimates for the number of sea lions in the estuary. She said her earlier work with acoustic tags had found even higher mortality, but an investigation determined that the pinnipeds could hear the pinging emitted every 90 seconds by the tags, which allowed them to home in on tagged fish. She said radio-tag telemetry will be added in 2015 to track adult salmon through the estuary to help get a clearer picture of where they drop out. DNA analysis of tagged individuals has also helped to identify where they came from. "The future of this study, given the developments in genetics, is pretty exciting," she said. Funding is provided by NOAA Fisheries and may cost $200,000 in 2015. Council members on the F&W committee seemed stunned by her analysis. Idaho member Bill Booth called it "quite a disturbing presentation." Wargo Rub said there could be a component in the tag-handling process that could increase the mortality estimate, but she noted some groups in May showed 100 percent survival to Bonneville. She said she wouldn't absolutely focus on the 2014 mortality estimate of 45 percent, "but I think the trends are definitely indicative that the mortality is increasing." Idaho member Booth noted that the Columbia Basin's annual F&W costs approach $1 billion a year. 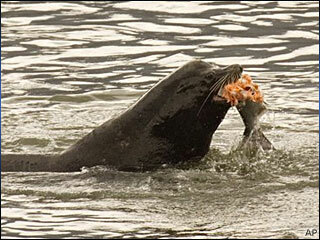 If nearly half the run is being consumed by sea lions, he said "we may have a problem that needs to be addressed." Doug Hatch, senior fisheries scientist with the Columbia River Inter-Tribal Fish Commission, said more sea lions began showing up in the river after spring Chinook runs started increasing in 2002 and 2003. Though their overall population growth rate seems to be tapering off a little, Hatch said weekly surveys have indicated much higher numbers of sea lions in the river in 2014. He said the increasing smelt returns to the Columbia over the past couple of years (they crashed after the eruption of Mount St. Helens in 1980) have likely contributed to the increasing sea lion numbers. Hatch noted that 600 to 700 of them were counted in a single day this spring on one boat that cruised between Bonneville Dam and the estuary. In 2013, ODFW personnel estimated that more than 1,400 sea lions were cruising the lower Columbia during the height of the smelt run. F&W committee Chair Phil Rockefeller suggested putting together a panel presentation on sea lion populations as soon as possible.